A dental implant mimics the form and function of a natural tooth, which consists of a root and a crown. The crown is the visible part of your tooth. It is used to chew food and is, therefore, the most susceptible to cavities. The crown is attached to the jawbone by way of the root. When decay has gone deep enough or when periodontal disease has advanced enough to warrant an extraction, the entire tooth, root and all, is taken out. A dental implant is a titanium post (like a tooth root) that is surgically positioned into the jawbone beneath the gum line that allows your dentist to mount replacement teeth or a bridge into that area. An implant doesn't come loose like a denture can. Dental implants also benefit general oral health because they do not have to be anchored to other teeth, like bridges. Once the root heals, we place an ceramic crown on top. The new crown is customised to match your bite and the colour of your teeth. Why not get in touch with us today? When it comes to the very best in Whangarei Dental Implants, we pride ourselves on reliable staff and trusted expertise. A dental implant is a pure titanium cylinder that is placed into the bone of the upper or lower jaw. The dental implant is a system for replacing a teeth or securing dentures. The implant system is comprised of three parts known as the fixture, the abutment and the prosthesis. The fixture is the actual implant that is inserted into to jaw bone. Once the fixture is placed, bone cells “integrate” with the implant to make it strong. Integration with the bone takes 2-6 months, due to the slow growth of bone, before the fixture can be used. There are many manufactures, sizes and shapes of implant fixtures available. The abutment is like the “middle man” between the implant fixture and the tooth or denture. The fixture has a threaded internal which will allow a variety of attachment to be screwed into it. There are many types of abutments to choose from depending on the desired final prosthesis, whether it be a single tooth, part of a dental bridge or to secure a removable denture. The prosthesis is what is attached to the attachment. The prosthesis can be a single tooth, a bridge or removable denture. The prosthesis can be cemented on the implant abutment, screwed in place or securely snapped into place for removable appliances. Implants are becoming the most widely used systems for replacing teeth in dentistry today. They are durable, last a long time (10+ years for most), and cannot decay. The procedure to place implants is becoming easier as new techniques are developed. Implants can improve your appearance, the ability to eat the foods you like, and boost your confidence. Dental implant are like your third set of teeth. Nature already gave us two sets, baby teeth and adult teeth. Now, implants are like the “Third” set. Implants can restore our smiles, our looks, our confidence and the ability to enjoy eating. We use our teeth more than most realise. There are more restaurant businesses in the world than any other type of business. People eat for more than just nourishment. Going out to eat or having friends over is one of humanities favourite activities. We find enjoyment in the flavours and textures of food as well as the social event of eating. Although dentures can provide a nice smile, they cannot restore the pleasure of eating due to instability and loss of taste. Without the ability to eat naturally, our enjoyment of life diminishes. A missing tooth can devastate a smile or cause your tongue to incessantly explore the area which is a constant distraction or irritation. Replacing a single missing tooth with an implant does not require modification or drilling of the neighbouring teeth to support a bridge or removable appliance. An implant replacement tooth is the closest thing to a natural tooth. Besides the obvious uses of teeth, like smiling and eating, teeth support our facial structures which affect our appearance. People that have teeth extracted don’t know what it is like until the teeth are gone. Even a single tooth lost affects the way we eat, the way we look and the arrangement of surrounding teeth. When many teeth are lost, our appearance changes dramatically and the loss of self confidence ensues. When back teeth or all teeth are lost, our chin becomes closer to our nose as tooth support is lost. This loss of support causes our mouth to close more which causes creases in the lips and to the side of our mouth. Also, our cheeks become sunken in which increases wrinkles and ages the look of our face. Restoring your dental support is like having a “dental face-lift”! Is it painful to have dental implants? If you have been putting off getting implant because you are worried that it might be painful, then don’t put it off any longer. Getting dental implants is a relatively easy procedure. In fact, it is less invasive than having a tooth pulled. A local anaesthetic is used to numb the area. A small slit is made into the gums to expose the underlying bone where a hole will be drilled and the implant inserted. The bone does not have any nerves in it to feel any pain so you won’t feel a thing while the implant is inserted. Sometimes the gums are stitched over the implant while the bone heals around the implant. You would not even know the implant was there. Other times, a healing cap will be placed into the implant and the gums will be stitched around the healing cap where you will see a metal dome protruding from the gum while the implant heals. After the procedure, there is usually very little discomfort during the healing part of the implant. Some people may experience a slight swelling of the area but that usually dissipates in a day or so. The healing phase of the implant can take anywhere from 2-6 months before the implant can be used to support an appliance. The first part of the implant process is the planning stage. A panographic x-ray is taken which shows a 2 dimensional view of all areas of the mouth. Using the panograph to show the state of your mouth, your desires are expressed and options to achieve the outcome are discussed. If implants are determined to be the best option, then an additional 3 dimensional x-ray (called a CBCT) is taken to determine if implants can be placed in the desired areas. The CBCT (Cone Beam Computerised Tomography) allows us to plan implant placement with the correct size, angle and approach before treatment. On the treatment day, the area is numbed with local anaesthetic. The bone is exposed and the implant is placed into the bone. In most cases, the implant must remain undisturbed for 2-6 months before the next step of placing teeth or denture onto the implants. There are situations when we can use the implant on the same day to support a denture or provide a temporary tooth. Once the implant has integrated into the bone, the implant is uncovered and an abutment is placed into the implant. An impression is taken of the implant abutment to send to the dental laboratory to make the final tooth, bridge or denture. Sometimes a temporary tooth or bridge is made to fit on the abutments at that appointment. Lastly, the final tooth, bridge or denture is anchored to the implant. 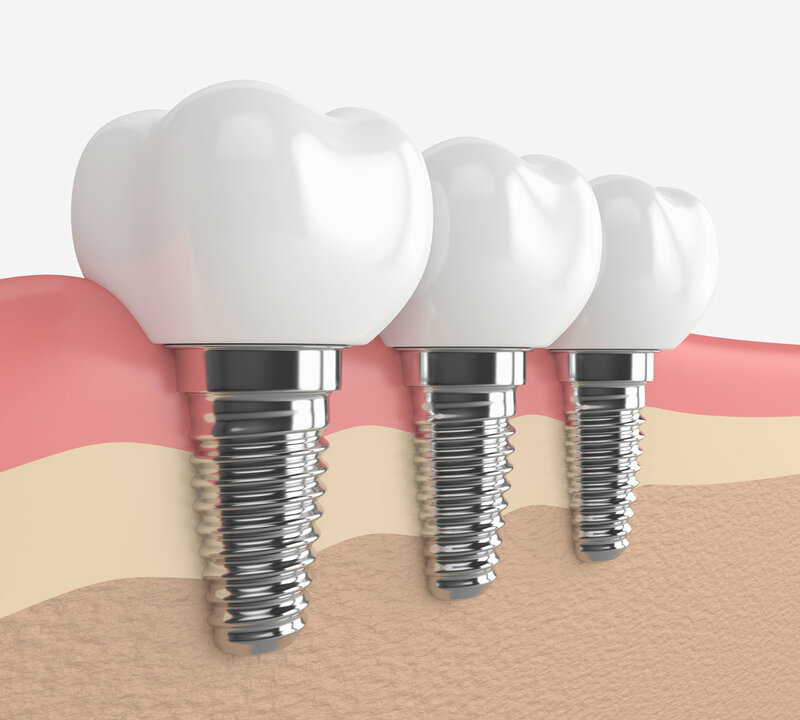 In the case of a tooth or bridge, cement or screws are used to hold the tooth or bridge to the implant abutment. In the case of a denture, snaps are used to hold the denture to the implant abutments directly or onto a specially shaped bar that the denture fits onto. Now that you have your new implant supported device, you must keep it clean and have regular checkups for proper maintenance. A properly maintained implant restoration can last a lifetime. The time determine factor of getting implants is dependant on the time it takes for the implant to integrate with the bone. If an implant is used to support a tooth before the implant has properly healed, the implant could be prematurely lost. The healing time for implants is from 2-6 months which depends on where in the mouth the implant is placed, the quality of bone where the implant is inserted, and what the implant will support as the final restoration. Upper jaws take longer to heal around dental implants than lower jaws. This has to do with the fact that upper jaw bones are much softer than the bone in lower jaws. The healing time in lower jaws is usually 2-3 months where upper jaws can take much longer. The quality of bone is another healing time factor. Sometimes there is insufficient bone to place an implant in a desired location which will require the use of a bone graft in the area. The required bone graft can be placed at the same time the implant is inserted but will lengthen the healing time as the bone graft itself must also integrate with the surrounding bone. The type of final restoration also determines the length of time an implant must heal before use. If you are having an implant supported bridge in the back of the mouth on an upper jaw, then we will want to be sure the implant has completely healed before inserting the bridge and will take the maximum time to heal of about 6 months. On the other hand, if you are having a complete denture placed on the lower jaw with 4 implants, the denture can be placed on the implants the same day as the implant placement. Implants can last a life time under ideal circumstances. However, there are many factors that determine the length of time an implant will last. These factors include your overall health, how well the implant and appliance are cared for, how the implant was placed in the first place and how much stress is on the implant. An implant will fail when the bone around the implant has lost the bond between the implant and the bone. The bond failure can occur when bacteria accumulate on the implant causing inflammation and infection. When this occurs, the implant becomes loose and must be removed. It is imperative the implant is kept clean and free from bacterial accumulation with daily maintenance and periodic visits to the dental hygienist, just like normal teeth. Over stressing an implant is another cause of implant failure. If you are a person who clenches your teeth when stressed, you are more likely to lose an implant placed in the back of your mouth. The number of implants supporting an area also play a role in how stressed is distributed during function. The more implants, the more support. The manner in which the implant was placed can also determine how long an implant will last. iI an implant is placed in an area which is not ideal for the function of the implant, then its life will be shortened. For example, if the available bone for an implant placement is not quite lined up to the opposing teeth, then the implant will be subjected biting forces at an odd angle and could fail prematurely. Your overall health and lifestyle can also affect the length of time your implant will last. If you lost your tooth or teeth due to periodontal disease or some other disease, then the likelihood of keeping your implant for life is reduced. Diabetes or prolonged steroid use can shorten the life of your implant. Smoking and excessive alcohol use can also shorten the implant life. The success rate of implants has increased dramatically since they became popular 30 years ago. Today, implants have a 90% success rate of keeping the implant for 10 years. Advances in implant technology, placement techniques and patient screening has led to this improvement. The science of implantology is constantly improving as more and more research is conducted every year. Now, implants can be placed in areas of the mouth that were considered impossible 30 years ago with a much higher success rate. One of the greatest factors in increasing the success rate of implants is the CBCT image which provides a 3 dimensional view of the area of interest. This allows the surgeon to avoid most circumstances which would cause an implant to fail. Of those implants that fail, most are due to maintenance issues while some failures cannot be explained. However, the good news is that most failed implants can be replaced with another implant and usually stay for good. How can implants help my dentures? If you are a denture wearer then you know all about the challenges of eating certain foods and the incessant irritation of lower dentures while they move about in your mouth. Even the best dentures move around in your mouth, especially lower dentures. Implants can help keep your dentures in firmly in place so you can enjoy eating again and freedom from contact denture irritation. In some cases, your existing dentures can be adapted to accept implant supports to provide stability. We have many patients who have received two or three implants on the lower jaw to support their lower denture who can now eat all the foods they want. Securing a lower denture is one of the greatest improvements for denture wearers. There are very few people who cannot have implants. As long as you are 18 years or older and in good health, you are a candidate for implants. Adults under the age of 18 have a bit of growing to do before implants can be placed successfully. This is due to the fact that bone is still growing and if an implant were placed in a growing person, its final position may not be where it was intended. There are some exceptions but as a general rule, implants are not placed in kids. There are really only a few health issues that absolutely rule out someone for implants. Uncontrolled diabetes, cancer of the bone (osteosarcoma and leukaemia) and a history of taking bisphosphonate drugs (for osteoporosis) are absolute contraindications for implant placement. What is All Teeth on 4 (or more) Implants? All Teeth on 4 (or more) Implants is a technique for placing implants and connecting a denture all in one appointment. There is quite a bit of planning for the treatment day which could take a month or two, depending on the circumstances. An All Teeth on 4 (or more) Implants procedure involves placing four implants into the upper or lower jaw and connecting a denture to the implants either with snaps or screws. The snap-on version of All Teeth on 4 (or more) Implants has the advantage of being removable so proper cleaning can take place. However, the snaps need to be changed periodically and the denture could become dislodged at an inopportune time. The screwed in version of the All Teeth on 4 (or more) Implants technique can be removed by the dentist but not by the wearer. The screwed in, or fixed, version feels more like real teeth than the snap on version as the denture can be made much smaller. However, the fixed version requires quite a bit of dexterity to properly clean under the denture and requires more maintenance by the dentist, every 3-6 months for routine care. The cost of having implants varies depending on the number of implants, where the implants are placed, if bone grafting or other bone modifications are required and the final device or prostheses used to restore the area. In our office, the cost of a basic implant is around NZ$3,400 which includes the fixture (what is inserted into the bone) the abatement (what connects the tooth to the fixture) and a single replacement tooth. The cost of a straight forward single tooth implant is just slightly more than a permanent bridge and much better. For more complicated cases, such as an All-on-4 replacement denture for either the upper or lower jaw, the cost in our office is about NZ$10,000 which includes 4 implants, abutments and a special denture. It is possible to use your existing denture, in some cases, which would save NZ$1,000-$2,000 off that cost. There are so many variables in implant dentistry that influence the cost. For an accurate estimate, please call to make an appointment for a consultation to find out if implants are right for you and your budget.